Is Airway bill a document of title? Can Airway bill be used as a document of title in Letter of Credit? Can Air way bill be used as Bill of Lading in DP terms of payment? Can goods under an Airway bill be transferred to another party? Airway bill is not a document of title by nature. However airway bill can be prepared such a way to treat as a documentary title. Airway bill is an evidence of meeting the contract terms of shipment. Also it is the receipt given by air carrier on receiving the goods. So, once after preparation of AWB to treat as document of title, such airway bill is treated as document of title and can be used to transfer goods to another party, not mentioned in Airway bill. Such transfer of consignee can be done by endorsing airway bill to such consignee. If an airway bill is made as document of title, such airway bill can be used under DP terms of payment also. Would you like to share your experience about transferability of airway bill? Have you experienced in converting an Air Way Bill in such a way to treat as a document of title? Share below your experience in handling AWB as a document of title. Comment below your thoughts about this subject - Is Airway bill a document of title? KIRAN DHURI: On 13 March 2014 what is the maximum date for issuing airwaybill? can AWB date after date of Let export date? Atique Anwar: On 22 October 2014 Bill of lading is negotiable document and awb is not why? 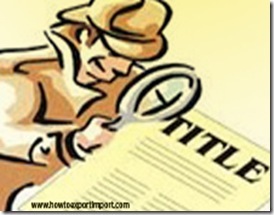 Who can file import documents in United States?